Note of January 30, 2016: this post was amended to reflect a reader's confirmation in the comments section that Helen was Helen Coy Greene. 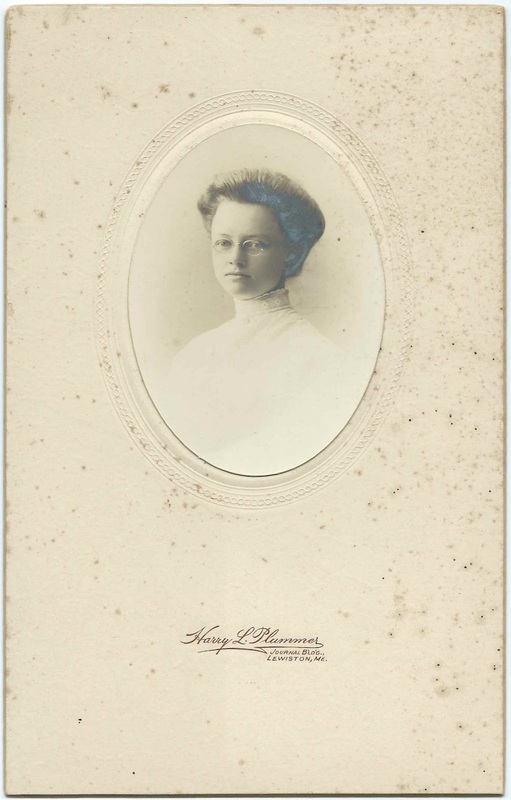 Photograph, presumably a graduation photograph, of Helen Coy Greene, who was a member of the Class of 1909 at Bridgton Academy at North Bridgton, Maine. She's mentioned in the General Catalogue of Bridgton Academy 1879-1916, featured in another post. At the time of publication, Helen was teaching at West Bridgewater, Massachusetts. Helen Coy Greene was born at Otisfield, Maine on September 28, 1891, the daughter of George Hartley Greene and Lizzie Florence (Buck) Greene. 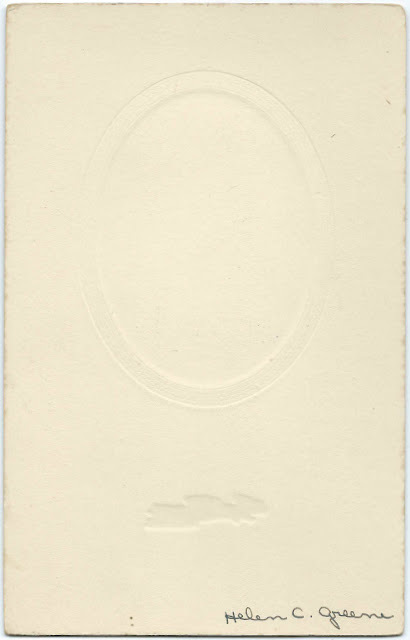 Helen was teaching at West Bridgewater, Massachusetts, at the time the catalog noted above was published. Helen and Rev. Bosworth married at North Bridgton, Maine, on August 27, 1918. They had, I think, three children, before Rev. Bosworth died October 15, 1927. On April 23, 1944 in Maine, Helen married Howard Leslie Doty, son of Zenas H. Doty and Ida F. (Gifford) Doty of Falmouth, Massachusetts. Howard was born March 26, 1884 at Falmouth, Massachusetts; he had previously been married to Eunice Landers and Agnes Clark. Howard died in 1974, and Helen in 1990. If you have corrections and/or additions to the information above, or if you feel that Helen C. Greene is another person, please leave a comment or contact me directly. I can confirm the identification of Helen Coy Greene of Otisfield, as I have seen other pictures of her so identified in relation to the Buck/Greene family.